"Goodbye, Sidney," I shouted at the English Channel from atop a windswept cliff. Beside me stood a gun battery where German soldiers fought during the D-Day landing in June of 1944. Just offshore, high tide surged over the remains of a prefabricated Mulberry harbor that the Allies brought to Normandy. Somewhere above the Channel's churning surf, that battle claimed Sidney, an uncle I never knew, an 18-year-old aviator shot down almost six decades ago. On this, my first visit to France, I seized the opportunity to pay my respects. 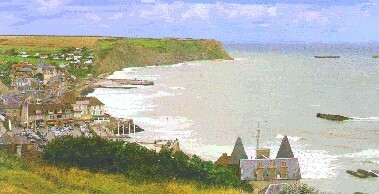 To my left along Omaha Beach stood a small seaside resort community, Arromanches-Les Bains (population 409). Farmers from this village have reclaimed the rich farmland around the battery. Now the countryside again resembles old photographs from before the war. The Normans are proud of their land and eager to conserve it for agriculture, so they live by choice in small, densely built villages with narrow streets. Each village has its own weekly market day, when the village center springs to life. Many of the region’s traveling merchants visit a different community each day. Through trade relationships with France’s former colonies and the European Community, the best of the world's fresh fish, fruit, and vegetables regularly reach these villages. Items unfamiliar to most Americans include a long, thin type of red sugar beet, exotic lettuces, Spanish blood oranges, and many species of fish from European waters. Everyone I met at market seemed tolerant of my feeble French; we communicated with smiles and pointed fingers. Throughout this corner of Normandy, World War II memorials abound. Some blend harmoniously into their 10th- and 11th-century surroundings; others reprise the garish commercialism that sullies some of United States’ Civil War battlefields. This region also contains a memorial to a very different war, the Battle of Hastings in A.D. 1066. The Bayeux Tapestry, celebrating William the Conquerer’s victory at Hastings, resides in the Bayeux Tapestry Center Guillaume le Conquérant, about 18 miles from Arromanches-Les Bains in the Gallo-Roman town of Bayeux (population 14,704). 30-31 Harold receives the orb and sceptre at his coronation. 38-39 The Duke's ship lands at Pevensey. No one is absolutely sure who embroidered the Bayeux Tapestry. Some say it was the household ladies of William’s queen, Mathilda; others attribute it to priests or to embroiderers in Winchester, England. However it came about, this immense work of art -- 230 feet long and 20 inches wide -- offers an exquisitely detailed view of 11th century life.